The Sheffield-born goalkeeper began his career as an apprentice with Lincoln City, signing his first contract in March 1978. In just over three years however, he only made a handful of appearance for the Imps, although he had the distinction of never conceding a League goal. Kevin had a brief spell at Boston United on loan during the 1979/1980 season, and in November 1981, he went on a free transfer to Kettering Town. He only played a couple of games for the Poppies before losing his place in the first eleven and went to Corby Town briefly on loan. On his return to Kettering Town however, he was still unable to regain a first team place, and he joined Rushden Town. He had a spell with Wellingborough Town in the 1983/1984 season before returning to Rushden Town in 1985 and was one of many players who joined Diamonds when the club was formed in the summer of 1992. He was to be the clubs No.1, but injury meant that his debut was delayed until midway through their inaugural season, with Kevin Shoemake taking his place in the first team. He worked as a stores and purchasing manager and stayed with the Diamonds for three seasons and after 83 appearances, went on loan to Raunds Town in November 1994. 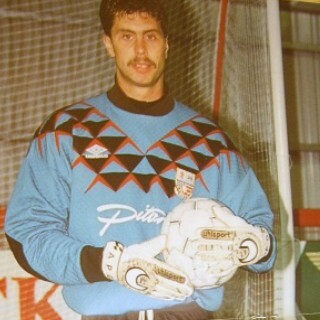 He was recalled in early February 1995 due to an injury to Martin Davies. After a further 16 games, he was released at the end of the season, and joined Raunds Town. After a spell with Rothwell Town, Kevin rejoined Corby Town in January 1998 at the age of 37 and was voted Player of the Year by the supporters the following season. He went on to become assistant manager with the Steelmen. He went on to manage Rothwell Town in the summer of 2001, joined Stewarts & Lloyds before being appointed manager in June 2003. He was then appointed manager at Whitworths in January 2008. In October 2008, Kevin took over as assistant manager at Wellingborough Town, but left at the end of that season following a management reshuffle. At the start of the 2009/2010 season, Kevin became assistant manager at UCL side Thrapston, before being appointed as manager of Division One side Burton Park Wanderers in March 2010. Despite his age, he was still active, and came on a a substitute in their league game against Wootton Blue Cross on 21 January 2012, at the age of 51. After a run of poor results, Kevin was relieved of his duties on 8 February 2013.